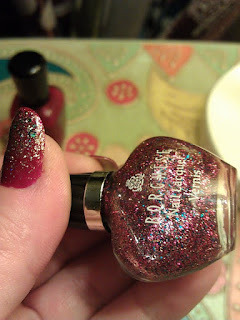 I'm Not Skinny: Glitter explosion gradient nails. I'm a reformed nail biter. Until April my nails were little more than nubs so needless to say I now love all things polish. I was feeling pretty sparkly today, so I decide to bling out my nails. The results are a super sparkly nail look. I'm thinking that this could be a great look for some holiday parties, it reminds me of ornaments or tinsel maybe? I'm in love regardless. 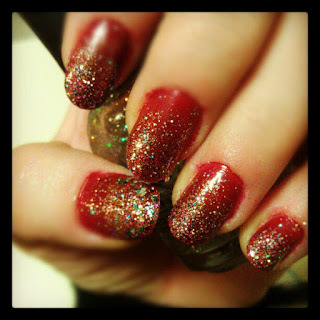 I did a simple glitter gradient over a rich red Zoya polish. Borghese nail lacquer Vernis: Unsure of the name (sorry friends, but below is a close up of the bottle). That's all I've got for now. I'm still new to the polish effects world, but I LOVE doing my nails. Even placed an order for a serious nail art kid that I'm anxiously awaiting the delivery of! 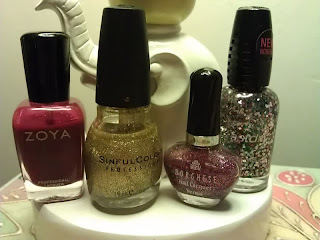 Since we're talking glitter, what is your favorite glitter polish?